Although we suggest Seahorse are kept in ‘species only’ tanks or systems, this is not to everyone’s choice and we are asked regularly about tank mates for seahorses. Seahorses however are not Reef fish. We have compiled a brief list of only those Fish species, Invertebrates and Algae that are appropriate for Seahorse tanks and that we feel pose the least risk to seahorses. There is a fair amount of choice on the list, to keep your tank interesting and safe, from what we have described as Safe Tank Mates. Please be aware there is always the exception to the norm, and some fish may occasionally display differently if mating or are threatened. However, placing any other fish or algae in with captive-bred seahorse may always pose a risk at a microscopic pathogen level that is not visible by normal means. Placing any of these often wild caught tank mates into a seahorse tank is therefore at your own risk. 0 = These species pose the least amount of threat to Seahorses. Competition for food is low, the fish are in general benthic (bottom dwelling) and peaceful. The Algae do not sting, although can release sticky substances when cropped and when stressed due to ‘a sexual’ reproduction. 1 = These species are still deemed to be safe, although there may be some competition for food. The fish have moved up into the water column slightly to feed. These fish are not fast swimmers nor are they aggressive, they are in general considered safe. Not all these species are suitable for bare bottomed tanks, due to their preferred habitats. LF = Live Food, some fish species have specific diets, such as Mandarins and require Live Foods. The species on this list, although compatible with Seahorses are not necessarily compatible with one another, and as such should not be kept in the same aquarium. Check them out fully first. This list is not fully comprehensive and we would always suggest undertaking your own in-depth research. Fish or invertebrates that are not on this list can pose a greater threat 2+ or significant risk a 3 or 4 to your seahorses and their introduction to a seahorse tank should be dealt with a much greater degree of caution. They should be fully researched prior to purchase and tank placement and then carefully watched thereafter. None of these Tank Mates on the list are deemed to be safe with H.zosterae. Please see the separate list for H.zosterae. If you are unsure, please ask. Corals and Polyps have not been included on this list as the majority of the seahorses available for sale to aquarists, do not live on Coral Reefs, so these animals do not form part of their natural environment, they don’t choose to live around these animals so why put them in your tank? who benefits? They are also not included due to potential damage to seahorses skin from their ‘stinging’ or ‘burning’ tentacles – ‘cnidae’, and ‘chemical emitions’, even though many are night-time feeders with tentacles only coming out to feed, they are still a potential hazard and it is extremely difficult to correctly differentiate between species. If it stings you it will sting your seahorse, they too have skin not scales. The phylum Cnidaria (and all subphyla or classes – Anthozoa, Cuboza, Hydrozoa, Scyphozoa, Staurozoa) have stinging cells – nematocysts, and can also give off a toxic mucus. Cnidarians include Jellyfish, Corals, Anemones, Hydroids, Gorgonians (Sea Fans, Sea Pens), Mushroom Corals (plate corals) are all of the phylum cnidarians and are related to jellyfish, hence the stinging cells – nematocysts and their means of reproduction. (like hidings places, best in groups, can be nocturnal, Pyjama cardinal may eat shrimp). (jump if startled, likes hidings places and sand for burrowing). a saltwater shrimp – not to be confused with Glass/Ghost shrimps that can be freshwater. (Harlequins and Starfish, do not make good tank mates, as Harlequin eat Starfish). Tank Mates List for H.zosterae only. (Species native to Florida, natural diet of H.zosterae). This list has been complied from our own experiences as Seahorse keepers and Breeders along with the aid of other website information, plus much of our own research and time. INVASIVE NON-NATIVE ALGAE SPECIES ! Please DO NOT USE or PURCHASE or STOCK Marine Green Algae (seaweed) Caulerpa Taxofolia and Caulerpa racemosa in your marine Aquarium. They are invasive non-native species. If you do have them dispose of them responsibly and correctly including all rock attachments – kill by freezing, chlorine, burning. Dispose in landfill, not down the drain. www.issg.org (IUCN invasive Species Specialist Group). This entry was posted in Care Notes on June 23, 2013 by ablundell. 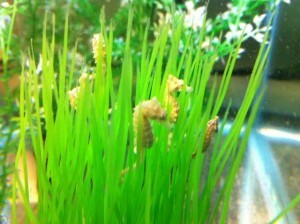 These Seahorses are captive-bred in glass tanks by seahorse.breeder. Hippocampus Zosterae are one of the tiny seahorse species, reaching more or less 4cm in length. They can be kept successfully in captivity, but do require live food – brineshrimp to be constantly available to them. They can be various colours: shades of white, yellow, orange or brown are the most common. All tend to have prominent crowns, whilst others also have cirri. H.zosterae should be sold at 2cm in length or more. Temperature: These tropical Seahorses are happy to be kept between 21-27 degrees C, they do well at 22 degrees C. This temperature is achieved by using a reliable heater-stat. Heat Spikes: Quick increases in temp will not be tolerated leading to stress and possible disease. 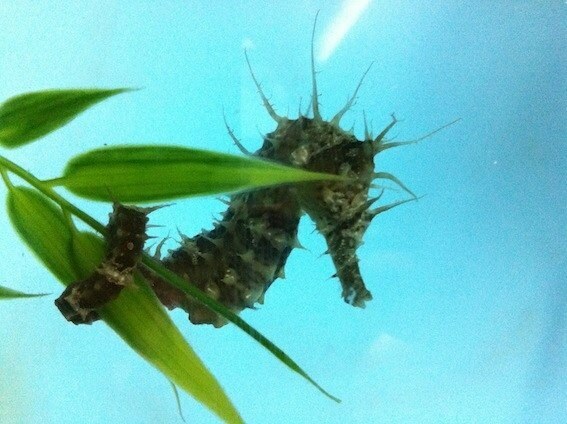 Maximum Seahorse size: 1.5 inches or 3 to 4cm. Behaviour: H. zosterae will happily live in ‘herds’ or as pairs. Breeding males when attracted to a ‘gravid’ female will quiver (vibrate) very quickly next to her, she will either respond in like or ignore him. Mating occurs in the water column. H. zosterae are a quiet species, happy to hitch and eat. They do not like to be disturbed and will quickly un-hitch, moving away from the disturbance in the water. Feeding: We keep this species with live tropical mysis shrimp, which act as both a cleanup crew and a live feed. In addition we feed 2-3 times a day, morning, noon and night on newly hatched brineshrimp. Check on density of brineshrimp in the tank prior to feeding, as you don’t want to overfeed either. Zosterae’s will feed from their hitching sites, the water-column and the tank bottom. Old food and excreta must be cleared away morning and night. It is essential to enrich the Brineshrimp, we use Rotigrow plus to provide the essential DHA’s. Breeding: H. zosterae will happily breed in a tank environment. Gestation by the male is 10-20 days dependent on water temperature. They normally produce 10-30 fry that can hitch from birth and eat brineshrimp. Zosterae fry are born at approx.1cm in length. They are also quick to grow on. Tank Size: Baseline for a pair (2) of H. zosterae is 20 litres with every additional pair an additional 6 litres needs to be added to be tank/system. Water changes: These must be undertaken on a daily basis to maintain a healthy aquarium and to keep ammonia levels in check. It is recommended at least 10-25% a week. Tank mates: Seahorses are best kept in a seahorse only tank, which is species specific – one species only. H.zosterae are very sensitive to stinging hydra, anenomes etc..which will sting, kill them and also consume their food. Distribution in Wild: Western Atlantic, Florida, Bahamas, Bermuda and the Gulf of Mexico. Habitat in Wild: Shallow estuarine species found in Seagrasses, at a depth of a few meters in pairs or small groups. IUCN Red List Information: Hippocampus Zosterae are listed as Data Deficient (DD) on the current Red list, previously the species was listed as Vulnerable, but was changed due to lack of data. However, Conservation Actions are in place to limit the trade and harvest of this species. H.zosterae are the second most common seahorse species traded for the Aquatic trade, therefore conservation of the species in the wild benefits directly from Captive-breeding Programmes (CBP’s) supplying the Aquatic Trade. Upon arrival remove the plastic bag containing your livestock from its box, place the bag in your aquarium and leave the bag to float for 15 minutes – this ensures that the water inside is the same temperature as your aquarium water. Slowly release the livestock from the bag, the seahorse should swim out of its own accord. Tip the bag on its side and allow it to swim out. This entry was posted in Care Notes on January 9, 2012 by ablundell. 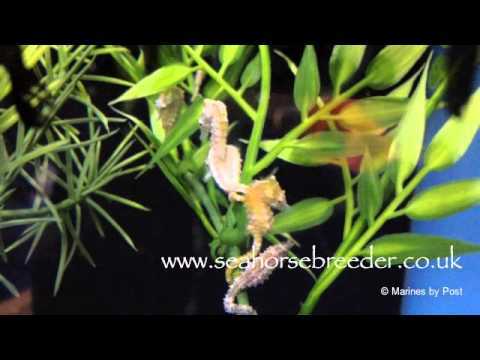 These seahorses are Captive-bred in glass tanks by seahorsebreeder. Temperature: Tropical Seahorses are happy to be kept between 21-27°c. This temperature is achieved by using a reliable heater-stat. Heat spikes: Quick increases in temp will not be tolerated, leading to stress and possible disease. Feeding: Feed 3 times a day, morning, noon and night, on defrosted frozen (gamma radiated) whole Mysid Shrimp. Tank-bred seahorses will feed from the water column and the tank bottom. Old food and excreta must be cleared away each morning and night. Breeding: H.erectus will breed readily in captivity giving birth to up to 400 fry. Gestation by the male is c.3 weeks/21 days depending on water temperature. Tank Size: A tank with a low flow rate with numerous non-spiky or fabric plants as hitching posts is ideal and a generous volume of 120-150 litres for 1 pair. The tank must be at least 3 times the height of the seahorse. eg; 6 inch or 15 cm seahorse requires a water column height of 24 inches or 61cm. Tank Mates: Seahorses are best in a seahorse only tank, preferably with another seahorse of the same species – species specific tank. Habitat in Wild: Shallow seagrass to deep water, soft-bottomed habitats of over 70m depth. IUCN Red List Information: Hippocampus erectus are listed as Vulnerable on the Red List. 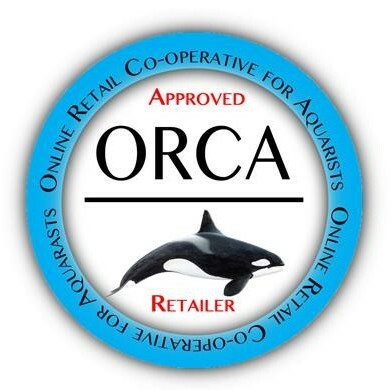 Conservation actions are in place to monitor and limit the commercial harvesting and trade for the Aquarium trade. H.erectus are one of the most commonly traded seahorse species for the aquatic trade, therefore conservation of the species in the wild benefits directly from Captive Breeding Programmes (CBP’s). The entire genus Hippocampus is currently listed in Appendix II of CITES. Start to add a little of your aquarium water to the opened bag (roll down the top of the bag to maintain it in an upright position) containing the seahorse/s – add a little at a time over a minimum period of one hour – this ensures that the pH, Salinity and temperature will be a matched.